We’re happy you found us. Our congregation's purpose is for persons of all ages to grow stronger in faith through worship, deeper through learning, warmer through fellowship, and broader by service to our neighbors in need. We offer: Sacramental worship, Biblical teaching and preaching, Spirit-filled community fellowship and outreach, a mission minded philosophy of living into the Great Commandments (Matthew 22:38-39), and Great Commission (Matthew 28:18-20) of Jesus Christ. Christ Church is a congregation of Christians based in Gilbertsville, NY. You can see more about our history in the “About Us” section. We worship in the Episcopal/Anglican tradition and consider ourselves an evangelical congregation striving to live out our mission statement of: "We will demonstrate God’s unconditional love and forgiveness daily, following the example of His Son, our Lord and Savior, Jesus Christ." 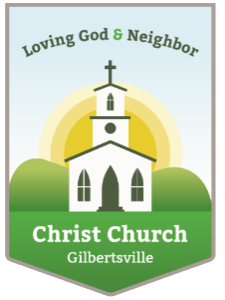 There's a place for everyone at Christ Church Gilbertsville to be involved and make new friends.